New Show! 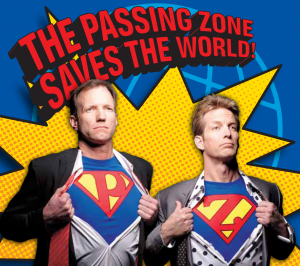 The Passing Zone Saves The World! Can Jon Wee and Owen Morse save the world through laughter and dangerous stunts? It can’t hurt to try, so that’s exactly what they are going to do! The Passing Zone has been wowing audiences for decades with hilarious, award-winning performances. They have been finalists on America’s Got Talent, they have performed at the White House, and they hold 4 Guinness World Records. Their combination of comedy, dexterity, danger, and hilarity has audiences on their feet all across the globe.